A Chinese mushroom picker stumbled upon a gargantuan hornets nest while foraging in the mountains, and did what any business-minded person would do: he enlisted the help of a few friends, took down the nest, and sold it. According to People’s Daily Online, the man who discovered the hive, identified as Wu, was out picking mushrooms when he first discovered the nest sitting in a 66-foot tall tree. “At the time, I was really excited,” explains Wu. And what did he do with that excitement? He hit up two of his buddies, suited up in beekeeper gear, and captured the 5-feet-wide, 86-pound hive. Wu explains the hornets’ anger when having their home dismantled: “We hadn’t even got to the nest when all of the hornets came out. There was probably around several thousand. It was quite scary.” Quite scary is the understatement of the century, Mr. Wu. After the hornets left, Wu and his friends took two hours to bring down the hive, smoking out any remaining hornets and removing it from its perch in the tree. The hive was still full of unborn hornet larvae when Wu and his buddies removed it, and can be seen in layers of neat rows in photos of the hive. After taking it out of the mountains, Wu sold the nest to a businessman from Changsha who wanted it for its alleged health benefits. But where do you keep a 86-pound, 5-feet-wide hornets nest full of larvae? How much does it sell for? How did Mr. Wu find a buyer? Craigslist? Ebay? 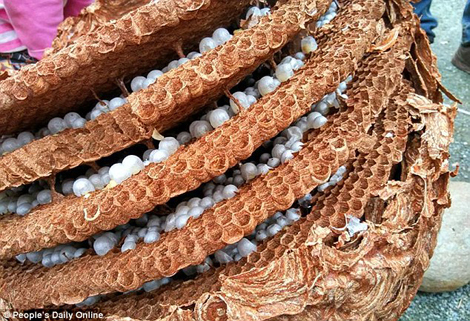 The behemoth nest is the second Land of the Lost-sized hornets nest found in China this week. Yesterday, tourists in Hubei found a 31-inch wide hive.